If making a crostata -- also known as a galette -- is intimidating to you, just make it in a pie pan. Not only will you get a rustic looking galette, but you'll have some guidance from the shape of the pie pan. For this recipe, we recommend using a refrigerated pie crust. That way you will have the whole thing in the oven in less than 10 minutes. This recipes makes the most of luscious pears that are just beginning to ripen, and a few cups of frozen berries (you can also use bagged frozen berries). If you're not sure about which type of pear you'd like to use, read below for tips on which pears are great for eating and baking! Preheat the to 450 F. In a medium bowl, mix the sugar, flour, and salt. Gently stir in the pears and berries to coat. Next, unroll the pie crust into an ungreased 9-inch pie pan. Spoon the fruit mixture into the pie pan and fold the edges of the pie crust over the filling, pleating it as necessary. Sprinkle the outer edge of crust with the remaining teaspoon of sugar. 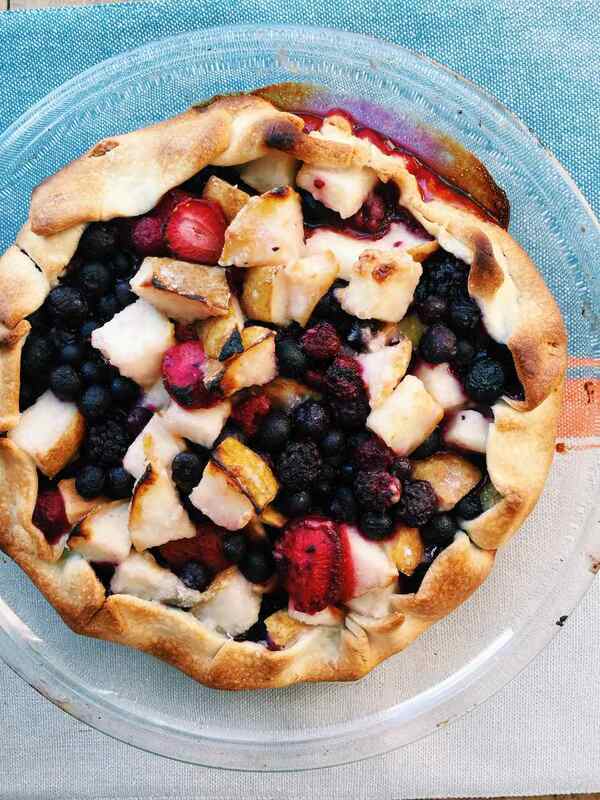 Bake for 30 minutes or until the fruit mixture is bubbling and the crust is nicely browned. Cool in the pan on a wire rack until warm or room temperature. Serve with sweetened whipped cream or vanilla ice cream as desired. In a mixing bowl, using a whisk or a hand mixer, combine the cream and confectioners’ sugar just until slightly firm peaks are formed. This will keep for up to 4 days in the refrigerator. If you'd like to make your own pie crust, all you'll need is flour, butter, sugar, salt, and some ice water. It's that simple, and you can store it in the refrigerator. While all pears are delicious, some are perfect for eating raw (anjous, bartletts, bosc, asian, comice), while others will either stay firm or fall apart when cooked, which will affect the dish you are making. Anjou, bosc, and French butter pears are great for keeping their shape, but Bartlett pears will fall apart, making it perfect for saucy dishes. Keep this in mind when selecting pears for this delicious crostata.